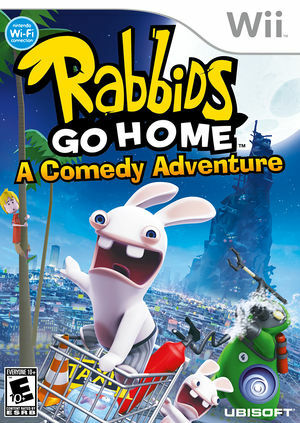 'Rabbids Go Home', known in France as Les Lapins Crétins : La Grosse Aventure (lit. "The Moronic Rabbits: The Big Adventure"), is a 2009 "comedy-adventure" video game developed by Ubisoft Montpellier and published by Ubisoft for the Wii and Nintendo DS. The game was released in North America on November 1, 2009, in Australia on November 5, 2009 and in Europe on November 6, 2009. Rabbids Go Home is the fourth installment in the Rabbids sub-series of the Rayman series of video games and is the first stand-alone title in the sub-series. The game's plot centers on the efforts of the titular Rabbids to collect as many human objects as they can and create a huge pile high enough to reach the Moon, all the while avoiding the extermination attempts by the "Verminators", who wish to gain back the stuff the Rabbids have stolen. Wii Remote sometimes loses connection. The graph below charts the compatibility with Rabbids Go Home since Dolphin's 2.0 release, listing revisions only where a compatibility change occurred.